Groupe US formé par Harry Douglas en 1936 et comprenant Vernon Gardner, George Lawson, Jimmy Lundy et Edward Ware. Les Deep River Boys ont enregistré dès 1940. En 1946, ils signent avec RCA où ils connaissent leurs plus grands succès en Angleterre. The Deep River Boys left a legacy of fine recordings during their 50 years of performing, setting a standard for professionalism and longevity that is to be envied. They began recording as a gospel act in the late '40s and later switched over and became an R&B act and were more popular in Europe for periods of time before coming home to the States for triumphant return engagements. Their story begins in 1936, when all of the Boys -- Harry Douglas (baritone), Vernon Gardner (first tenor), George Lawson (second tenor), Jimmy Lundy, and Edward Ware (bass) -- were still students at Hampton Institute in Virginia in the mid-'30s, singing in the school choir. They began appearing on radio and in 1937, landed a job on the CBS network replacing the Oleanders (whose lead singer, Billy Williams, had left to form the Charioteers). 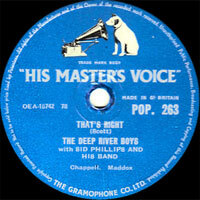 The Deep River Boys signed with Bluebird Records in 1940 and began recording material, including "By the Light of the Silvery Moon" (which featured Fats Waller on piano). When Harry Douglas went into the Army, he was replaced by Leroy Wayman, who in turn was replaced by Rhett Butler. Douglas returned to the group in 1946 and The Deep River Boys began enjoying their biggest success, appearing on Milton Berle's and Kate Smith's shows and touring with Bill "Bojangles" Robinson. 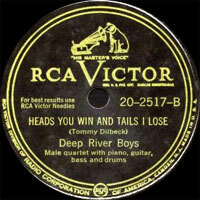 Like many Vocals groups in their day, The Deep River Boys had more success with live performance than record sales, and it wasn't until 1948's "Recess in Heaven" that they enjoyed their first hit. Unfortunately, the newer R&B was just then emerging and their gospel sound was being pushed aside by popular Vocals groups like the Dominoes, the Orioles, and the Ravens. 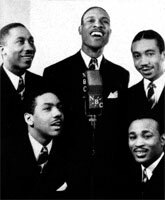 Unlike the 5 Royales (a gospel group who began recording R&B sides for Apollo), The Deep River Boys were reluctant to change; instead, they followed the path of another great gospel group of the '40s -- the Delta Rhythm Boys -- and began performing more often in Europe. They spent the early '50s shuttling back and forth, working in America with the Count Basie Band during 1951 and Erskine Hawkins, but also signed on for a record-breaking ten-week engagement at the London Palladium. They later left RCA for the independent Beacon Records label, which had been reactivated by owner Joe Davis. However, several singles for Beacon failed to generate any new interest and the Boys returned to RCA. In September of 1953, Cam Williams replaced Jim Lundy and the newly configured Deep River Boys returned to England and signed on for a nine-week appearance at the London Palladium. 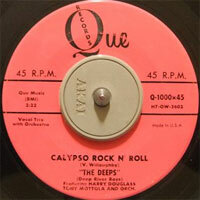 In the springtime of 1954, they once again found themselves back on Davis' Beacon Records for a second time. 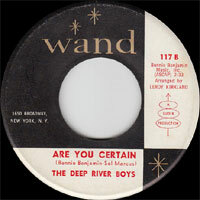 Throughout the rest of their career, The Deep River Boys continued to have sporadic releases on labels such as the RCA-subsidiary Vik Records, as well as Gallant and Wand. George Lawson retired in 1950, followed six years later by Ed Ware in 1956 (he died shortly after). Vernon Gardner also left in 1956. Bass Vocalsist Ronnie Bright replaced Ware (he'd previously been in the Cadillacs). 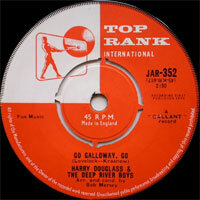 In 1963, Bright had a hit of his own, "Mr. Bass Man" (number 16) with Johnny Cymbal. He later joined Carl Gardner's lineup of the Coasters. 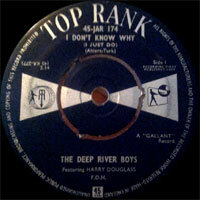 Amazingly, a Harry Douglas-led Deep River Boys (with a revolving lineup of new members) continued to make appearances well into the 1980s, 50 years after their founding. In his 80's, Douglas continues to perform occasionally. 1950 ? 78 t. HIS MASTER'S VOICE B-9960 (UK) . 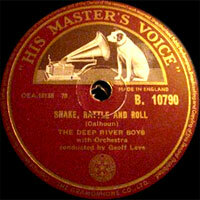 1951 78 t. HIS MASTER'S VOICE B-10012 (UK) . 09/1954 SP HIS MASTER'S VOICE 7M 244 (UK) . 1955 78 t. HIS MASTER'S VOICE POP 113 (UK) . 01/1956 78 t. HIS MASTER'S VOICE POP 157 (UK) . 1956 SP QUE Q-1000 (US) . 1960 SP TOP RANK JAR 352 (UK) .